Microsoft have started disabling SMB1 protocol for samba mounts. This means that any samba mounts that use SMB1 will not be accessible. This issue occurred on a samba share I use connected to my Raspberry Pi. The feature that disables the SMB1 protocol is called the “SMB 1.0/CIFS Automatic Removal”. Once it has been installed in the Fall Creators update it will disable the SMB1.0 protocol after a period of time. To fix this issue we can easily re-enable the SMB1 protocol. 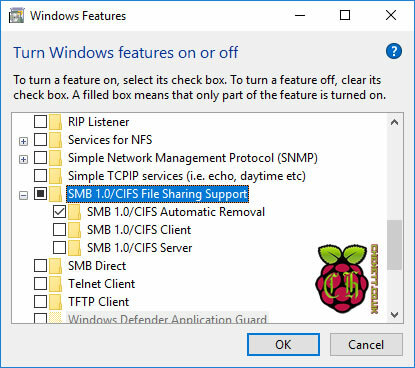 First you need to open “Windows features” and navigate to “SMB 1.0/CIFS File Sharing Support”. If you currently cannot view samba shares you will see “SMB 1.0/CIFS Client” unchecked. To resolve the problem check this box. To ensure it is not disabled in the future you will also want to uncheck “SMB 1.0/CIFS Automatic Removal”. This will disable the process that is used to remove the feature. Once you press OK it will search for the feature and install them. This will require a reboot. Once the machine is rebooted you will be able to properly use SMB 1.0 mounts again. If you have any questions about this feel free to leave a comment.